The end of SLS patents – The current crop of 3D printers use fused filament fabrication (FFF), also sometimes called fused deposition modeling (FDM). This process was originally patented in 1989 by [Scott Crump], co-founder of Stratasys, one of the largest manufacturers of commercial 3D printers. These patents expired in 2009 and the open-source community boomed shortly after with an onslaught of affordable and competitive desktop 3D printer. Being able to affordably sinter metal parts in your garage is a ways away. However, the MetallicaRap open-source SLS project currently estimates that their final kit will cost over $10k. A polymer only open-source kit with a small 40 watt laser will likely retail at the low $2k level to compete with open-source photopolymer based SLA machines. 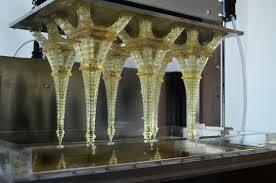 SLA printers go BIG! – We are very excited for the new class of affordable large format SLA printers like the Solidator by Tangable Engineering and Pegasus Touch by FSL3D fully funded on Kickstarter. The build platforms included on these units are larger than standard FFF printers while offering the extreme detail that SLA technology has to offer. Furthermore, the reported speed of these units is more than impressive, with full bed layers at 0.1mm layer height being completed on the Solidator printer in 10 seconds! While both companies report to have affordable liquid polymers available, we are waiting to see piece cost reports from actual users before making the leap. 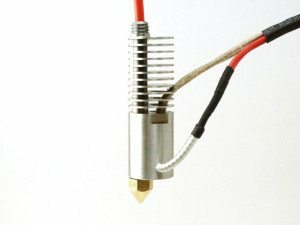 500C all metal passively cooled hot-ends – B3 Innovations is pushing the envelope of FFF machine capability by developing the Pico all-metal RepRap hotend capable of continuous printing at 500C. This will allow for high speed printing of exotic materials such as Polycarbonate which requires printing temperatures above 300C at high extrusion rates. This will also allow filament manufacturers to consider developing additional exotic composite materials which would have been otherwise impossible to print. Although 3D printing metal structures from low melt alloys is theoretically possible with the Pico, it has not been officially supported by B3 Innovations at this time. We ordered 3 hot ends through their successful Kickstarter campaign with additional nozzles to experiment with. Mike from B3 was extremely helpful in answering all of our questions regarding how to interface the Bowden mount with our printer. 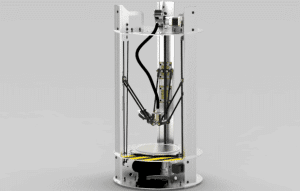 Open-source multi-material printing and Bowden extruders – The Tri-Color Mendel has been available for nearly a full year now and new affordable multi-materials open-source 3D printers are coming to market at an increasing rate. These multi-material printers allow for usage of multiple colors, materials and extrusion profiles to give the operator greater control over the output. This trend, along with the ever-consuming need-for-speed has generated a trend of increasing adoption of the Bowden type extruder system. The Bowden setup (as opposed to the classical direct drive) moves the extrusion stepper motor from the x-carriage to a fixed location on the printer frame. This reduces the moving mass and frees up space for mounting additional nozzles. The trade-off is the hysteresis that is developed in the filament guiding tube (between the fixed stepper and the moving nozzle) during prints which requires additional fine-tuning of the print settings. We plan to pair our Tri-Color with 3 Pico’s and passive cooling modifications for a highly controlled and robust build environment. 3D pens – We just received our 3Doodler and absolutely love it. It’s addicting! Whenever we think of the phrase “rapid prototyping” it is hard for us to think of anything faster than whipping out the 3D pen and tracing our ideas out right in front of us. 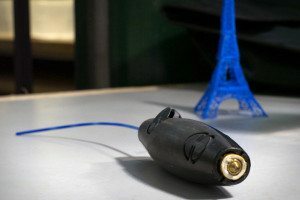 Of course the words “tolerance” and“accuracy” go flying out the door with 3D pen creations, so these are much more suitable as outlets for creativity than prototyping accurate mechanical parts. We believe every serious artist and creative designer should try one out. 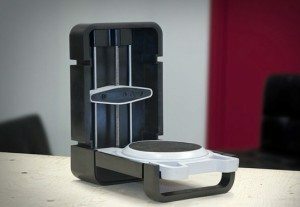 The year of the Delta printer – There were three different delta printers actively pitching on Kickstarter simultaneously just in December! The trend towards delta printers makes sense: less moving parts and increased symmetry. This means that the delta printers should be able to move faster and have increased reliability over the standard Prusa based bed designs. With less parts to worry about they are also cheaper, quick to assemble and easier to maintain. We are waiting for a robust multi-extruder delta design to emerge before getting our own, but if you are looking for an entry or mid level desktop 3D printer, we would suggest starting with the Delta’s! Full Body Scanning – The 3D revolution is all about merging our digital and physical worlds together. Full Body Scanning (FBS) brings that ideology to a whole new level by allowing us to instantaneously digitize life-sized objects. With FBS open-source projects such as the Pi-Camera 3D scanner, posing for minutes is no longer required. Action based 3D scans of moving subjects can be taken with stunning results. We are currently working on our own prototype of an FBS Pi-Camera based 3D scanner kit and plan to have it up and running by the end of January. 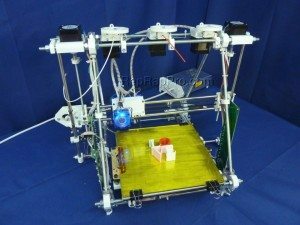 The Automated Build Environment (ABE) – We are currently developing a smart universal cover for RepRap based 3D printers that senses and adapts to the surrounding environment to provide optimal internal printing conditions. It utilizes an array of precision sensors to detect suboptimal build conditions and actively corrects them or alert the operator of issues that need attention. ABE also provides universal automatic calibration of the print bed with extremely high precision, allowing operators to attain superior results without investing hours in fine-tuning 3D printer hardware calibration. We may be most excited about the fact that ABE also provides active filtration of the build environment with a reusable filter, which will allow us to print indoors continuously without worrying about the damaging effects of toxic fumes emitted when printing. We expect to begin selling the initial ABE kits this summer. 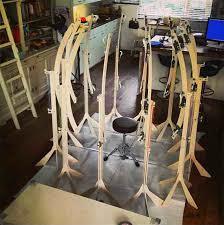 Dehydrating Evacuated Storage Cabinet (DESC) – The funky name of this technology that we are developing should be exciting to anyone who has been using their 3D printer for more than a couple of months. Humidity is a huge issue for most 3D printing materials as they are hydroscopic and tend to absorb moisture. The moisture collected on the feedstock material causes defects from the evaporated steam upon extrusion such as blowouts or bubbles on the surface of the printed part. DESC is a technology that we have created as a long term low humidity storage solution for 3D printing filaments which actively removes the collected moisture in a low temperature environment. This is crucial, as thermoplastics will tend to warp when heated to remove the moisture. DESC units are expected to begin pre-order this summer. 3D Printer World Expo – The largest 3D printer expo ever will take place on January 31st to February 1st in Burbank, CA. All of the major commercial developers in the 3D printer industry will be there showing off their new developments and generating excitement for the year to come. Please let us know what you are excited to see in 2014 related to 3D Printing!